Those people who were offended by those cute Charmin bears doing their business are gonna go nuts when they see this newish Publicis UK-created Charmin clip called A Little Bit Rude which has great fun highlighting the many names we give to a certain bodily function. To accompany the video, Charmin has made, perhaps, the best use of a blog to date: encouraging people to submit their favorite euphemism for taking a dump. Believe me, there's some you've definitely never heard before such as "Backing the big brown motor home out of the garage" and "Releasing the chocolate hostages." Have fun. Add your own. And please. Please make sure you forward this to all those people you know will be offended so we can all pretend we're in elementary/grammar/primary school again. Come on. Just for today. Then we can leave the bathroom humor behind and go back to our boring lives. It's not only the Got Milk campaign that's got the "got." Gathering together all the ads created by people who can't seem to come up with a headline better than "got...fill in the blank," Albuquerque agency 3, begs marketers to hire an agency. Any agency. Preferably theirs, of course but any will do. If you ever created a "got" ad, you might feel a bit uncreative after watching this video. Fly, a sort of Leap Pad for teens, has launched a site to promote the pen top computer which, when used with special paper, can do all sorts of cool things according to the three teens and one dude featured in several videos on the site. We're not sure if it was the cute Asian-ish girl or the very natural sounding video clips that kept us on the site for far longer than is normal for us but whatever it was, this site just seems to do a great job explaining the product in a very conversational tone that doesn't sound forced. Why we'd need a pen top computer, we're not sure but we seem to have the urge to go buy one now. Dancing With the Stars' Kelly Monaco and former Burger King queen Brooke Burke are bringing Gillette's NoScruf campaign (previously) to New York's Herald Square today around noon with a rally to carry the movement's message: we aren't going to shave until you do. Boston's Digitas created the faux, Geocities looking site to launch the cause that encourages men to shave - with Gillette razors, of course - by threatening men with women who don't shave. At the event, there will, apparently, be an army of unshaven women freaking out the men of New York. It's the double standard kind of thing. Public relations firm Porter Novelli organized the event. If anyone attends, please send us pictures. After Mentos caught wind of all this video that displayed explosive geysers when Mentos and Diet Coke are combined, Mentos said, "Cool. This is great." Coke, apparently suffering from some sort of refusal to believe the way advertising message are conveyed have changed dramatically said, "It's an entertaining phenomenon. We would hope people want to drink more than try experiments with it." Right. 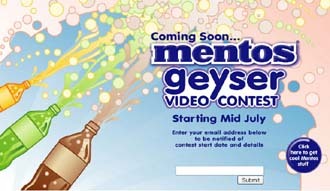 Anyway, Mentos is leveraging (oh, I hate that word) the trendlet and will launch the Mentos Geyser Video Contest in mid-July. As B.L. Ochman reports, the contest will encourage people to send in their best videos of the mixture and, presumably, win prizes for their efforts. Coke, on the other hand, will likely sit this one out but, at the same time, thanks Mentos for encouraging people to buy Diet Coke. Yup, it's a win-win. It's always funny to watch a fat drunk guy try to make his limbs obey his head and that's exactly what Mullen and the Ad Council have given us in this Hispanic-focused Buzzed Driving campaign. 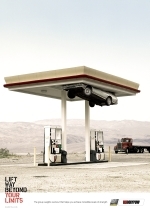 The campaign, which focuses on driving while not quite drunk but buzzed, broke just prior to the July 4th weekend. Apparently, according to the NHTSA, lots of Hispanics drive drunk and motor vehicle addcidents are the leading cause of death for Hispanics ages one through 44. Draft New Zealand has created a campaign for fitness company Les Mills International that steers clear of typical health club imagery in favor of striking images that promote individual aspects of the health chain's offering. From weight lifting to martial arts to balance (whatever that is) to cycling, the chosen images catch attention far better than your average health club image. You can see all the ads here.